Italy, a place known for its fine arts and craftsmen has more than its share of small kit manufacturers that produce fine resin models. Cre.El, Regia Marina, Delphis, Amati, Pegaso, the list goes on and on. All produce some outstanding resin castings, and all are relative bargains compared to the offerings from Asia and the rest of Europe. 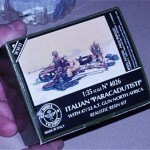 Model Victoria is one of these companies, and it produces some fine kits, among them an Italian 47 mm Anti tank gun and a 3 man paratrooper crew. Cre.El also has a 47 mm in its line, and although the 2 are similar and have the same parts breakdown, there are several distinctions: Model Victoria’s kit includes a crew while Cri.El’s does not. Model Victoria also includes some “mini diorama” accessories like shells, shell casings, ammo boxes, a tool box, and barrel cleaning tool. Cre.El’s kit allows for building in either the firing position or towing position, no small distinction as when firing the gun’s wheels are removed and the front is supported on a retractable foot, one leg of which serves to lock the barrel in position when retracted, for towing,and the spades are removed and stored under the trails. Finally, Cre.El’s instructions are better and the fit of the retractable support is better. Since I wanted to show the gun in action and Cre.El. doesn’t make a crew specifically for this weapon, I built the Model Victoria kit. The kit is molded in a dark grey resin, slightly waxy and less brittle than the familiar tan stuff, but softer. The molding quality was excellent, with no voids or bubbles apparent. The gun itself consists of 15 pieces, not including the separate wheels and the piece that would secure the trails together when towing. These can’t be attached without re-engineering the kit anyway. Each crewmember is molded in 4 pieces, torso and legs together, with separate head and arms. For people only familiar with injection molded kits, this wouldn’t be a bad introduction to resin. The parts breakdown is pretty much the same as an injection molded kit, and even the tiny hand wheels and the screws for the spades separated cleanly from the pour stubs. At this point, I discovered the only 3 casting errors in the kit. One of the tires had 2 voids in the tread where the pour stub was removed, easily filled with Zap a Gap. Between the barrel and recuperator on the left side was this “squiggle” thing that I had assumed was supposed to be there until I checked references! Careful carving with a new #11 and a chisel point, followed by a touch of a fine riffler file and wet or dry sandpaper eliminated it. Finally, when assembling the uniquely shaped spade head and handle, the spade head itself broke. Holding it up to a light revealed a couple of large air bubbles in it. I put it aside for now. Later I may make a replacement from sheet stock. Assembly was straight forward. I was concerned about snapping the Barrel/recuperator molding into the cradle, fearing the cradle would snap, but it went in fine. The hand wheels and sight fit to positive mounting points-no guesswork needed. Just make sure you align the hand wheel at the back of the cradle so the handle is on the bottom because the gunner’s hand is designed to fit over it. The instructions don’t show this. The axle needed a little cleaning of the holes that the pins on the underside of the base of the gun fit into, but better this than having to guess at the alignment. Make sure the top leaf spring is parallel to the ground before the glue sets. The folding trails are molded separately, but all the hinge work is on the base piece. Dry fit and trim until you are satisfied with the fit. One of mine was perfect out of the box, the other required moderate trimming on the underside. Check the photo on the cover or go to Cre.El’s website for a photo to identify which one is the right and which one is the left as, once again, the instructions are no help. Align them carefully and use slow setting superglue to allow minor adjustment after assembly. I made a simple jig from balsa sticks to level them horizontally, and set them in the vertical by eye. The spades slide over the ends of the trails. these had a mold parting line I cleaned with a sanding stick (my wife’s emery board-I’m cheap). The screw and clevis pin go on next, and again Model Victoria has mercifully provided a clear point of attachment on the molding. These are mirror imaged and for once the instructions show what side each goes on. Finally I attached the tripod front foot, using my jig to keep the gun level. This is important because of the way the crew interacts with the gun. The bi-pod portion of it fit nicely, but the front leg did not line up when the gun was level. Looking at Cre.El’s drawing of the gun in the towing position, this piece is not attached to the foot, but hinges on the base and swings up to secure the gun in place when the foot is retracted. I assume it similarly served to lock the foot in place when the foot is in the firing position. I wound up cutting it off and replacing it with some Evergreen round stock I had. If you do this, don’t forget to add the lug on the back. The gun is now done! Prime it, paint it (in North African colors, nach) using the painting guide included and start on the crew. Before detaching from the pour stubs, check the part numbers as all the “1”s belong to the same figure, all the “2”s, etc. The problems with the instructions continue with the crew. The gunner is designed to straddle the trail, peer through the sight and operate the hand wheel but you wouldn’t know it without looking at it. I added the right arm and head with him more or less positioned on the gun. The fit is great, the pose natural. He is squinting with one eye and has a satisfied “I got you” expression on his face. All I had to do was clean out the opening in his hand a bit with a round file. The commander is a little odd: he reclines on his left side, like a Roman at table, feet toward the enemy and supporting himself with his left hand on the trail. The only photo on the box top shows thegun from the left, so all you see is the commander’s head and I arrived at the correct position only through trial and error. Properly assembled, he fits well although the pose is curiously passive. The folded jacket included in the kit is his, by the way. The loader shares his commander’s laid back attitude. While again well molded, the right arm is molded with a shell in its hand. On both knees, he reaches for another shell with his left. First of all, he looks more like he’s searching for a lost contact lens than in a pitched battle loading a fast firing gun. And why does he need 2 shells? What’s he going to do, open the breech with his teeth? This is a personal preference and is in no way a comment on the molding of the figures which are crisp, have natural expressions, believable, achievable poses and the drape of the clothing fits the pose. You can see the commander’s neck muscles tighten as his head turns to the side. They just seem out of sync with the gunner. I have a couple of Italeri’s Italian paratrooper kits, one of the figures being a kneeling radio man, and there are binoculars and other equipment in it. The molding isn’t the best and in no way approaches the crispness, detail, and animation in the Model Victoria kit, but with some elbow grease, a razor saw and Milliput I’ve made a passable commander, binoculars in his right hand draped over his knee and gesturing with the left. All in all I was pleased with the kit. Basic assembly took less than an hour, after figuring out where everything went, and it was cheap, less than $50.00. Not available everywhere to be sure, but worth looking for and a nice change from a PAK 40 or 6 PDR.